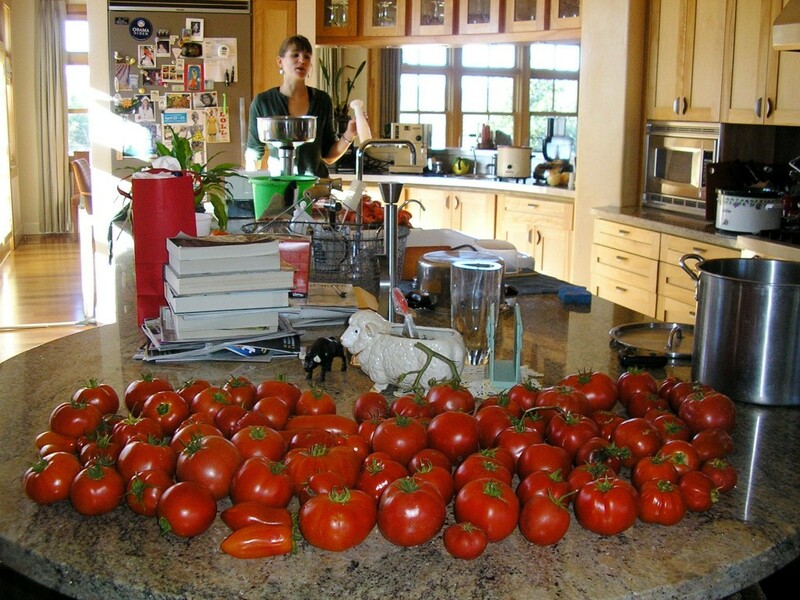 Sarah getting ready to put the tomatoes through the food mill. 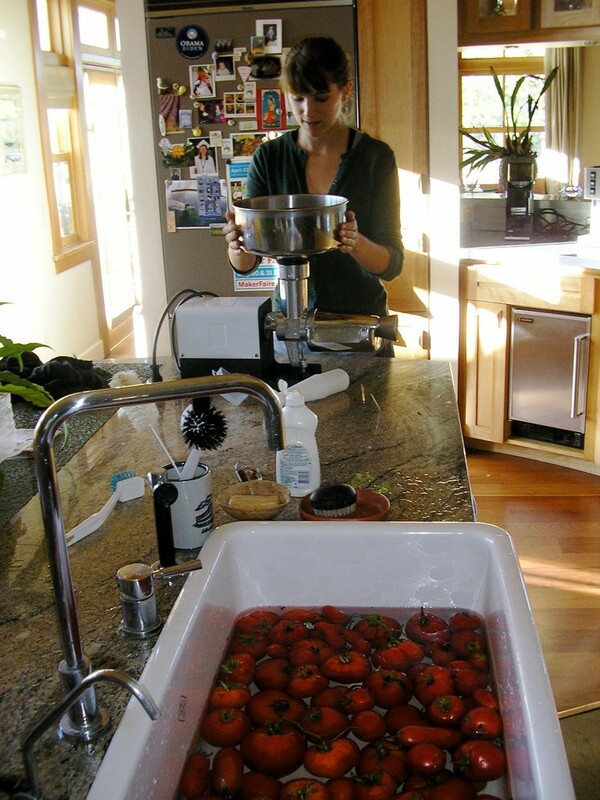 Once you wash the tomatoes, all you have to do is slice them so that they fit in the mill. Sarah removing jars from the oven where they were sterilized at 250 for 10 minutes. In the pot, the tomatoes are cooked down to a thicker consistency. Jars are finished in the hot water bath to seal the lids. Dale canned these jars of sauce last week, now stored in the pantry. Canning Debate and A Green Tomato Recipe!! 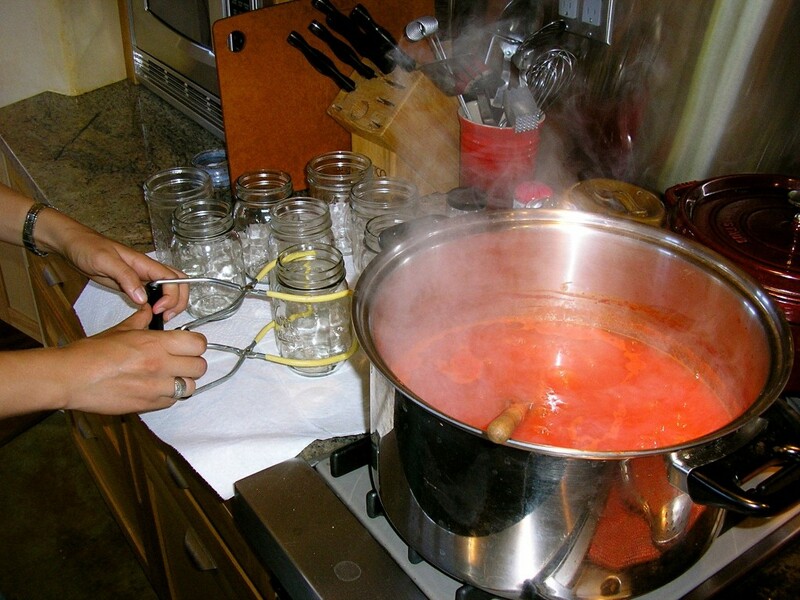 Traditionally people have been able to use a boiling water bath to can their tomatoes with no adverse health affects. The Boiling Water Bath method (or BWB) is used for food items with a high sugar or acid content, which is why people most commonly can fruit preserves or pickles. Tomatoes are on the borderline of having enough acid in them to process using the BWB. 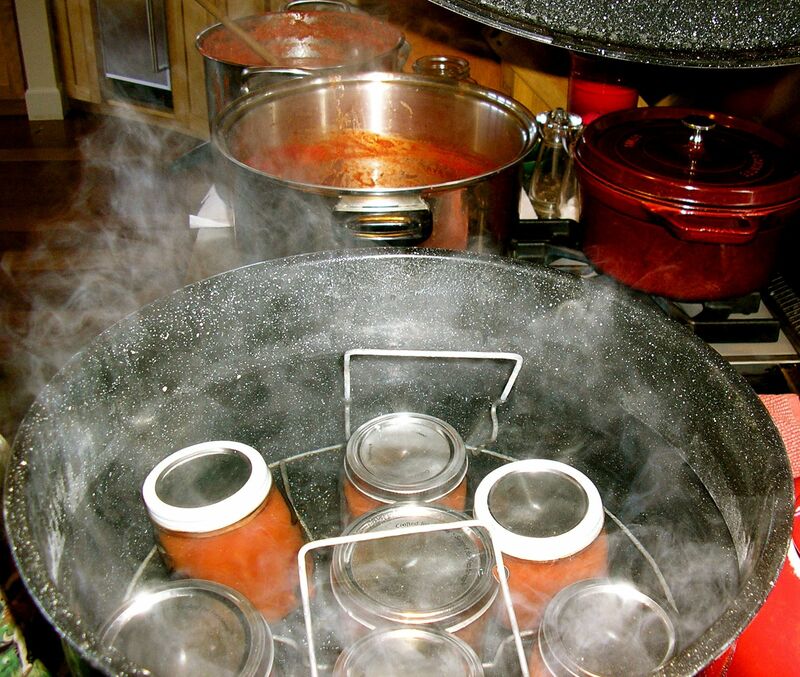 My mother and grandmother have both used this method for many years with no problem and always have beautiful canned tomatoes and sauces. If you are really worried canning using a pressure canner can take away any risk as pressure canners allow you to can low acid food. Most canning books give instructions on how to use a pressure canner. If you still want to try the BWB you can always add a little lemon juice or citric acid to each jar of tomatoes to raise the acidity and this is sufficient to get rid of any risk as well. To ensure the best acid content always use vine ripened tomatoes. Bring water, vinegar, sugar, salt, and garlic clove to boil in a non-reactive saucepan. Boil 5 minutes. Poke a hole with a toothpick, knife blade or skewer in each of the cherry tomatoes. Add 1 T each of the seeds, 1 bay leaf and one chile to each pint jar. Double the quantities if you are using quarts. Pour the hot brine over the tomatoes. Cover and allow to cool. Refrigerate for a week before sampling.